The Politics of Precaution examines the politics of consumer and environmental risk regulation in the United States and Europe over the last five decades, explaining why America and Europe have often regulated a wide range of similar risks differently. 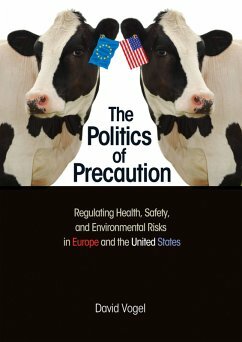 It finds that between 1960 and 1990, American health, safety, and environmental regulations were more stringent, risk averse, comprehensive, and innovative than those adopted in Europe. But since around 1990, the book shows, global regulatory leadership has shifted to Europe. What explains this striking reversal? David Vogel takes an in-depth, comparative look at European and American policies toward a range of consumer and environmental risks, including vehicle air pollution, ozone depletion, climate change, beef and milk hormones, genetically modified agriculture, antibiotics in animal feed, pesticides, cosmetic safety, and hazardous substances in electronic products. He traces how concerns over such risks--and pressure on political leaders to do something about them--have risen among the European public but declined among Americans. Vogel explores how policymakers in Europe have grown supportive of more stringent regulations while those in the United States have become sharply polarized along partisan lines. And as European policymakers have grown more willing to regulate risks on precautionary grounds, increasingly skeptical American policymakers have called for higher levels of scientific certainty before imposing additional regulatory controls on business.